Wifi streaming through Darrynane Cottages! 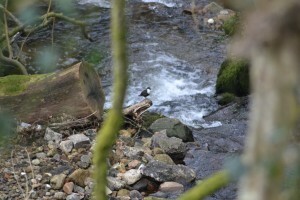 Nicole’s photo of a dipper on Tor River taken from The Stables garden in March 2013 – it made her day! At last we can proudly announce that Darrynane cottages now have BT infinity unlimited broadband Wifi. At the house we had BT infinity installed in February and it worked well after years of very slow internet performance. We immediately sourced it for the cottages. After speaking to a number of companies we employed Richard, a local internet whiz who has worked with us before with our computers and who has installed a number of systems throughout Cornwall. We tested a system in early April and after a bit of tweaking we had it fully installed last week. It is now working well and more importantly we are including free unlimited broadband Wifi in our tariff. So you don’t have to come on holiday and leave your tablets, laptops or phones behind! For those who follow me on twitter or like me on facebook you will know we have been updating the Lodge of late. It began with a simple bathroom facelift and gradually seeped through into the whole cottage. It was finished on Saturday afternoon with the cooker hood and cooker being wired in. David and I spent yesterday cleaning and putting it back together. I quickly took a few photos to get them up for all to see. It took longer than expected but the results are great! Our first guests arrived on Friday and they are bowled over by the Lodge. They couldn’t believe how spacious it is and the decor – well they’ve booked for September so something must be right!! Visitors staying at The Stables recently watched a Dipper moving along the river bed from their bedroom window. Nicole managed to get a photo above, thank you for sending. Spring is definitely on its way, even though the weather contradicts this, as the sheep are back on the moor. 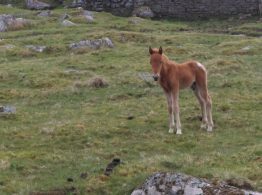 They are housed in nearby fields from October – mid April as part of the Moorland Stewardship Scheme. The highland cattle are back on Kerrow moor too. This is where they produce their young. After they are born and a few weeks old they move away. Last year I missed a great photo of several calves trying to eat from a tree, they nearly pulled it down. By the time I got back with my camera they were gone! I now keep it with me at all times! We have a couple of weeks left in the Lodge during May so if anyone is thinking of a holiday or fancies a break let me know – it needs to be used now it is looking so good! 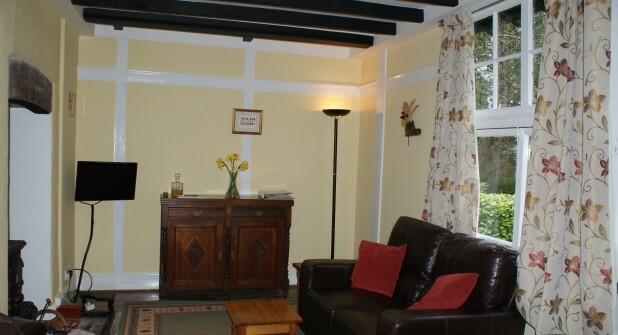 Short breaks for two £45 per night min. 3 nights inclusive of all electricity, wifi, bed linen, towels and wood or £220 for the week. 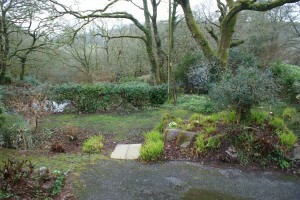 The Lodge woodland garden in early Spring!